Why are America's insurance companies not following their European cousins and divesting from fossil fuels? What if hospitals sold crack, doctors offered cigarettes in their waiting rooms, and firefighters gave out flamethrowers? As the one-year anniversary of the Tubbs Fire approaches, it’s worth looking at the hypocrisy of California’s insurance industry. Last year’s wildfires produced $12.7 billion in insured losses for the industry alone due to unprecedented fires precipitated by global warming, yet the industry invests in and insures the coal and other fossil fuel projects that are exacerbating climate change. Top European insurance companies have gone the other way and are ditching the fossil-fuel industry. Seventeen insurers with assets of at least $10 billion each have divested from coal. Six of the world’s biggest insurers — Allianz, AXA, Munich Re, SCOR, Swiss Re and Zurich — have limited or ceased their insuring of coal projects. AXA and Swiss Re have also limited their underwriting of tar sands projects. Public filings reveal that nine of the 10 largest American insurance companies acknowledge that they have considered the impact of climate change on their investments, but only two, AIG and Farmers, say that they have altered their investment strategy in response. The climate-risk disclosure survey by the National of Association of Insurance Commissioners also shows that America’s biggest company, State Farm, did not even consider the risk of climate in its investments. The insurance industry, which has to pick up the pieces, is the one global entity that can affect fossil fuel infrastructure. Extreme fossil fuel projects — ones that involve energy-inefficient and ecologically-dangerous coal, tar sands and Arctic drilling, such as the Keystone XL — cannot go forward without insurance. However, AIG’s strategy is to make homeowners insurance harder to get, not end insurance for coal and tar sands excavation. 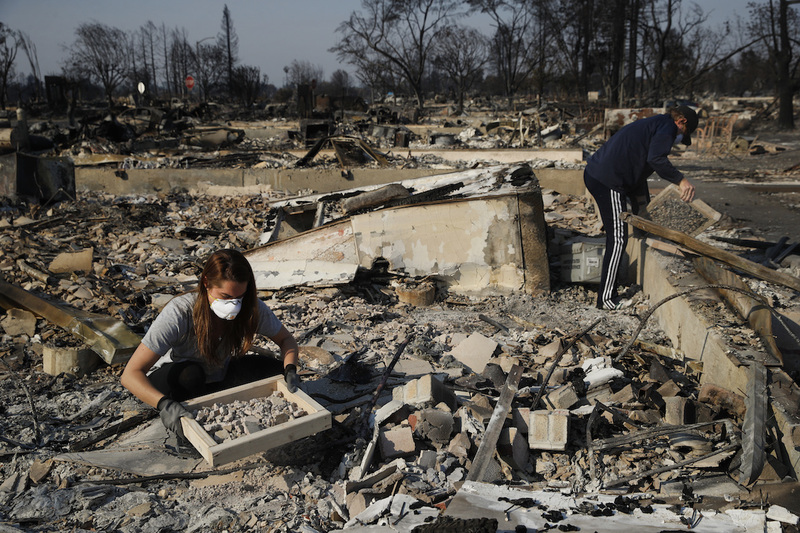 Insurance companies’ approach to catastrophic fires is increasingly not to sell insurance in fire areas, to raise rates or not to sell adequate replacement costs coverage. Meanwhile, they keep insuring the extreme fossil fuel infrastructure that makes catastrophic fires more catastrophic. In other words, USAA knows global warming kills but if there’s easy money to be made now on oil, gas, and coal, do it, because there’s always time to bolt later. A new coalition of public-interest groups, Insure Our Future, has called on America’s insurance companies to follow their European cousins and divest from coal and tar sands companies, and to make plans to stop underwriting extreme fossil fuel projects. The answer, thus far: Pound tar sands. Only one U.S. insurance company, Lemonade, has taken the pledge to get off fossil fuels. Insurance companies should not be betting against their policyholders. California’s insurance commissioner has been at the forefront of raising the issue, but he hasn’t forced the companies to disclose their fossil fuel underwriting and divest. That will be the job of the next insurance commissioner. Too many policyholders have lost too much in wild fires like Tubbs for there to be any more complacency. Insurance companies’ response to climate change should be to side with the victims, not support the perpetrators. Jamie Court is president of and Michael Mattoch counsel for the nonprofit group Consumer Watchdog, part of the Insure Our Future campaign.